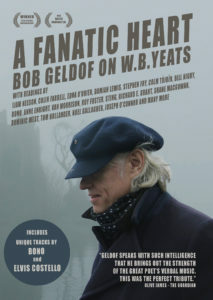 Through performances of some of Yeats’ most iconic poems by leading Irish and British cultural figures, Bob Geldof reveals how Yeats and others built the scaffolding of a new independent Ireland decades before the Rising – and how Yeats’ vision for a modern, pluralist, inclusive Ireland was pushed aside by the narrow-minded Catholic elite of the new Free State. The physical version of the film is accompanied by a CD featuring readings from the award winning documentary. Other bonus materials include additional footage featuring both Bob and his celebrity contributors, e.g. Bono, Shane McGowan performing recitations of additional poems by Yeats; a new song set around the poem, ‘A Terrible Beauty is Born’ which features a vocal by Bono (which Bob coordinated for the DVD extras; 73 poetry readings and 23 discussion pieces! Featuring Roy Foster, Stephen Fry, Bob Geldof and more.